Frosty the Snowman is all decked out for winter and ready to party!! Perfect for any bar or holiday gathering, wonderful gifts, fun decorations and party favors. Lightweight non-woven fabric, content 100% Polypropylene, plastic lined to keep your chairs clean from spills. Fits Most Standard Armless Dining Room Chair Backs up to 19-inch wide. Add some fun to your next brunch, dinner, or winter themed birthday party this Christmas holiday season. Sure to bring smiles to everyone who sees them! 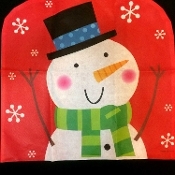 Cute bright red and snow white FROSTY the SNOWMAN chair back covers are an easy and festive way to dress up chairs and delight kids and guests of all ages. Slip over the back of most chairs for a special decorating surprise at any winter themed or pretend tea party!